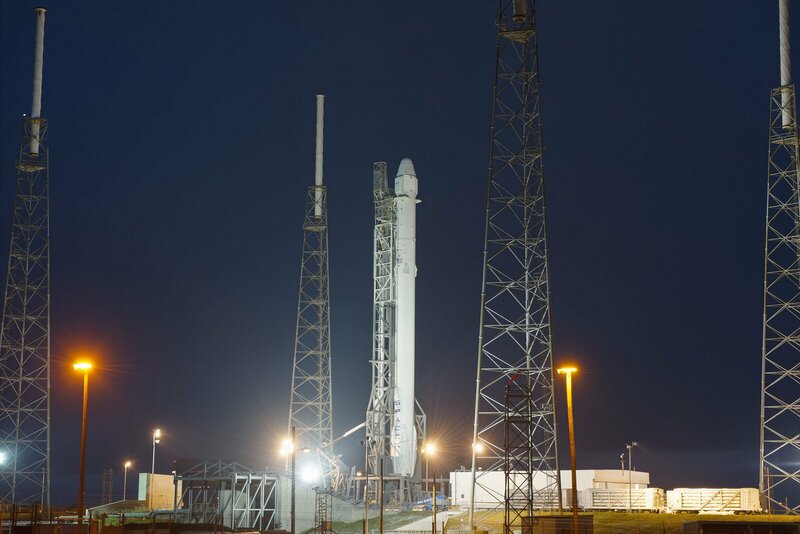 Standard for ISS launches, Falcon 9 will only have an instantaneous launch window at 4:45:23 UTC, 12:45 a.m. local time. Lifting off from Space Launch Complex 40, Falcon 9 will travel north east, firing its first stage for just under two and a half minutes before handing off to the MVac-powered second stage for a 6.5-minute firing to lift Dragon into orbit. The booster will re-start its engines three times – first to reverse its direction of travel and fly back to Florida, then to slow down for re-entry and finally for a propulsive landing on the flat concrete pad at LZ-1. SpaceX approved the Falcon 9 rocket for liftoff after Saturday’s Static Fire Test and the Launch Readiness Review that followed in the evening as a final look at all systems needed to support the launch. 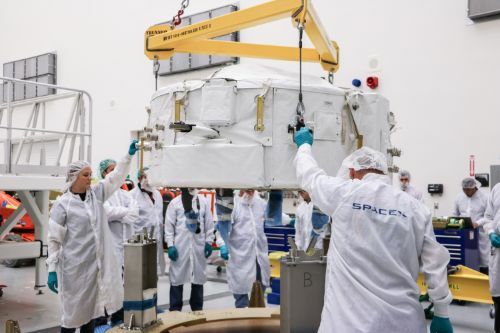 Falcon 9 was returned to a horizontal position for late cargo loading operations on the Dragon in the morning on Sunday, utilizing a mobile White Room to access the spacecraft until a few hours before launch – a unique capability in the Station’s cargo fleet. 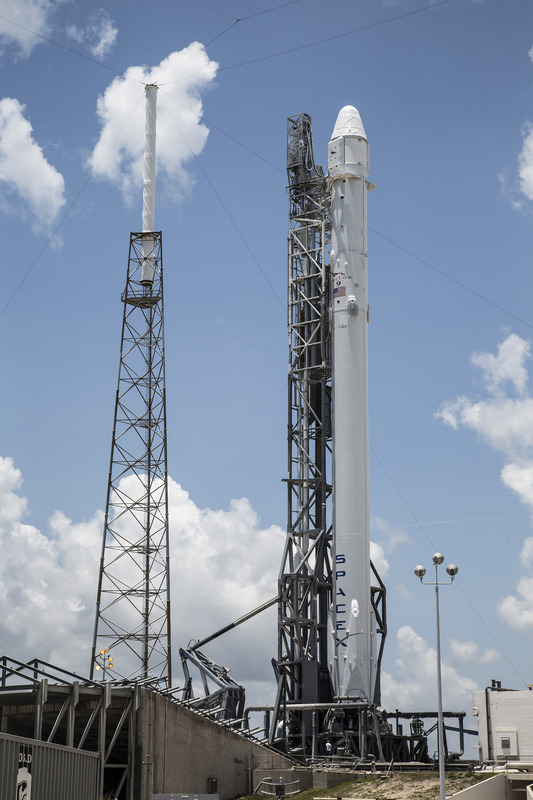 Lifted into a vertical position, supported by its Strongback, Falcon 9 headed into a lengthy countdown operation. Weather is expected to be favorable for launch with a 90% chance of acceptable conditions issued by the 45th Weather Squadron, only leaving a small chance of cumulus clouds and flight-through precipitation getting in the way. Standing 65 meters tall atop its launch pad at Space Launch Complex 40, a former Titan launch site, the Falcon 9 rocket is powered up six hours ahead of the expected T-0 time to head into its lengthy countdown. After detailed checkouts of the rocket and all ground systems, teams will make the final hands-on work to put all facilities at the pad in the appropriate configuration for launch. With around four hours to liftoff, Air Force Range Controllers will take up station at the Morrell Operations Center to begin monitoring the clearance of the launch corridor. Once fully checked out, Falcon 9 begins its tanking sequence that – owed to the use of densified propellants – is much more complex than that for previous launchers. The tanks of the two-stage rocket will be chilled down before propellants start flowing, beginning with Kerosene loading that is followed by the initiation of LOX flow into both stages at T-33 minutes. 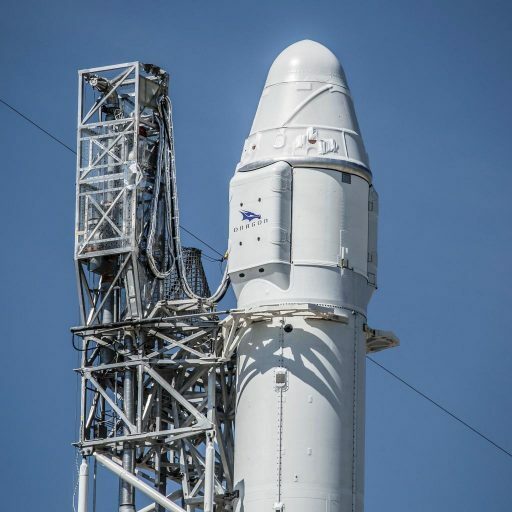 Due to the use of sub-cooled propellants, SpaceX has to ensure that the tanks remain in a predictable condition at liftoff with the desired mass of propellant on board with minimal thermal gradients. To make sure propellants inside the tanks remain at liftoff mass, SpaceX implements a new rapid propellant loading sequence, filling the Falcon 9 with over 500 metric tons of LOX and RP-1 in less than half an hour with only about a minute of margin in the Oxygen loading operation. The SpaceX Launch Team will go through the poll for a GO/No GO for propellant loading at T-38 minutes followed by the initiation of propellant flow between 35 and 32 minutes prior to the planned T-0 time. In the last hour of the countdown, Falcon 9 receives its updated flight software including the parameters for its landing attempt. 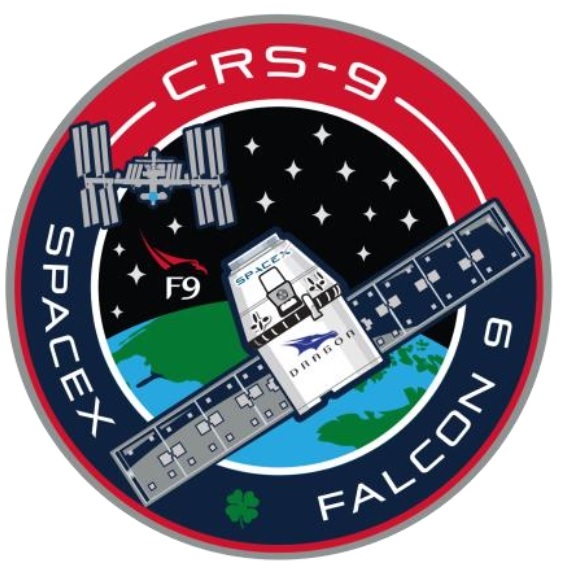 The Dragon spacecraft will be verified to be on internal power and in flight mode before Falcon 9 heads into the last ten minutes of the count during which the final polls of the Launch Director and Eastern Range will occur. For the SpX-9 launch, areas of the Kennedy Space Center and the Press Site will be closed from L-1 hour due to additional safety concerns for a Dragon abort scenario early in the ascent. 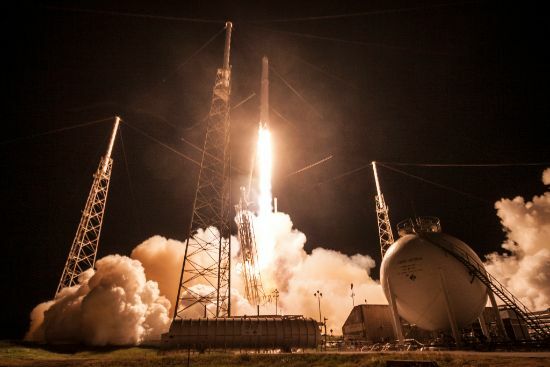 This is primarily due to persistent winds from the sea which could cause Dragon – if separating from Falcon 9 in the early ascent phase due to an abort – to be blown towards Kennedy Space Center. Upon a possible hard landing, Dragon could release toxic fumes from its hypergolic propellant which would then spread due to winds. At T-10 minutes, the Merlin 1D engines on the first stage will begin their chilldown sequence by opening LOX pre and bleed valves; at T-6 minutes, Falcon 9 begins switching to battery power followed by the preliminary pressurization of tanks to provide stability to the rocket. The two Strongback cradles will open and the large support structure will retract to its launch position three and a half minutes before blastoff. A final Status Check occurs at T-1.5 minutes and Falcon’s flight computers switch to auto alignment. Commodity loading ends at T-90 seconds followed by the start-up of the flight computer at T-1 minute. Three seconds ahead of liftoff, the nine Merlin 1D engines will be ignited using a pyrophoric TEA-TEB mixture that initiates the combustion process before propellants are injected into the engines that will each soar up to a total thrust of 735 Kilonewtons. Computers will monitor the start-up of the engines to ensure a total liftoff thrust of 694 metric ton-force is achieved before Falcon 9 is committed to launch. Rising from its pad under the loud thunder of its nine engines, Falcon 9 will climb vertically for around 20 seconds, clearing the tower. Falcon 9 will begin heading to the north-east via its pitch and roll maneuver, departing the Space Coast for a quick flight over the Atlantic. Heading uphill, Falcon 9 will break the sound barrier just over a minute into the flight and encounter Maximum Dynamic Pressure around 68 seconds after liftoff. The Merlin 1D engines are throttled down around MaxQ to limit stress on the vehicle. While the first stage is still firing on all cylinders, the MVac engine on the second stage will initiate its in-flight chilldown sequence to prime itself for start-up shortly after stage separation. MECO – Main Engine Cutoff – is expected two minutes and 21 seconds into the mission, leaving the first stage with a sufficient reserve in propellant to make it all the way back to the Space Coast. Three seconds after engine shutdown, the pneumatic stage separation system will be initiated to cut the connection between the two stages and push the first stage away to clear the way for the ignition of the MVac engine on the second stage. Coming to life at T+2:32, the upgraded MVac engine of the second stage will soar to a thrust of 95 metric-ton-force to fire for 6 minutes and 30 seconds to push the stack into orbit. Flying across the Atlantic Ocean, the second stage will head into terminal guidance mode late in its burn and safe its Flight Termination System when approaching cutoff nine minutes and two seconds after lifting off from Florida. Dragon separation is expected at T+9 minutes and 37 seconds. No target orbit was given ahead of Monday’s launch – previous Dragon missions aimed for orbits around 210 x 350 Kilometers, 51.6°. With the second stage on its way, the first stage booster will begin its ambitious secondary mission that – although not part of the primary mission objectives – will likely be the main focus of the night. 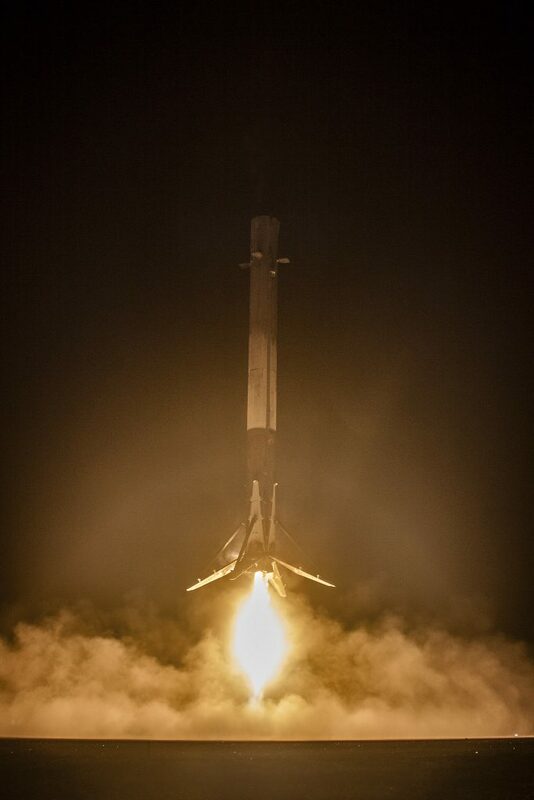 It will be SpaceX’s tenth attempt to return a first stage, four boosters have been recovered to date – three after successful Drone Ship landings at sea and one in the only previous land-based landing at Landing Zone-1, formerly Launch Complex 13. Immediately after separation from the second stage, the booster will fire up its Nitrogen thrusters to swing around to an engines-first position to be ready for a full boost back burn. Lighting three of its engines, the first stage will fire approximately 50 seconds to fully reverse its direction of travel and accelerate back toward Florida. The four actuated grid fins will deploy while the booster is still in space, ready to provide three-axis control once reaching the discernible atmosphere. 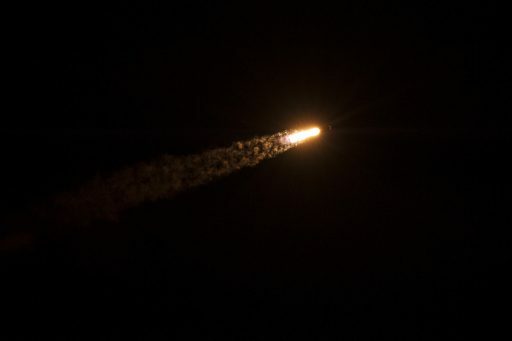 Six minutes and 31 seconds after launch, the first stage will be about to enter the atmosphere, firing up a subset of its engines for up to 20 seconds to slow down for re-entry. Missions completing a full boost back have a much more benign re-entry environment in terms of heat load in contrast to flights that utilize a ballistic flight trajectory up to the entry burn. 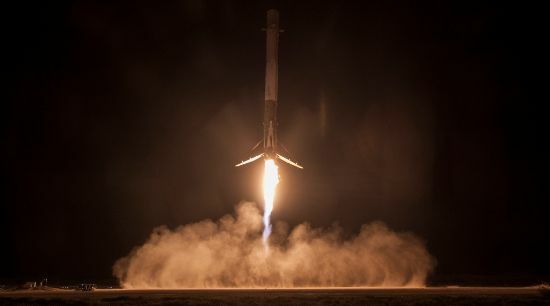 SpaceX also worked out procedures to protect the Merlin engines during re-entry, implementing onboard resources to prevent fluids within the engines from boiling to guarantee a clean start-up to full thrust during the landing sequence. This is particularly important for high-energy missions when the engines are subjected to more extreme thermal environments upon re-entry. 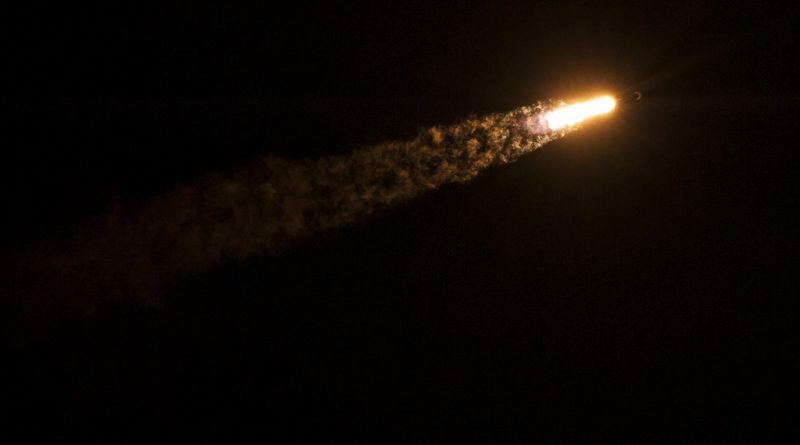 Completing its entry burn, the first stage will be set for 50 seconds of atmospheric descent into Florida – employing the grid fins to correct the final cross-track errors toward the landing site and modify the booster’s angle of attack to precisely control its downrange distance to make sure it reaches the proper position for the landing burn to target the landing site. Sonic booms will announce the arrival of the booster as it falls toward the Space Coast at supersonic speed, going through the transsonic region just before the final landing maneuver. The vehicle will become visible to spectators gathered along the Space Coast once lighting up on its landing burn. Firing up its center engine just over half a minute prior to touchdown, the booster will home-in on the SpaceX logo painted on the flat concrete pad at LZ-1, deploy its four landing legs and hopefully come to rest upright a little over eight minutes after launch. While the exciting journey of the first stage comes to an end, Dragon will arrive in Low Earth Orbit. Immediately after separation of the Dragon spacecraft, the propulsion system will be primed by pressurizing its propellant tanks and beginning to pulse the Draco thrusters of the vehicle to establish a controlled attitude for the jettisoning of the solar array fairings. Once the solar array covers are gone, the two arrays will be deployed to start generating power. 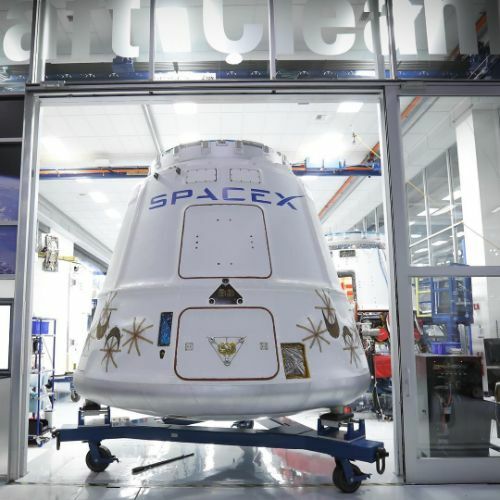 Teams at SpaceX Mission Control in Hawthorne, California, will conduct a vehicle status checks to verify Dragon is in good condition and ready for on-orbit operations. 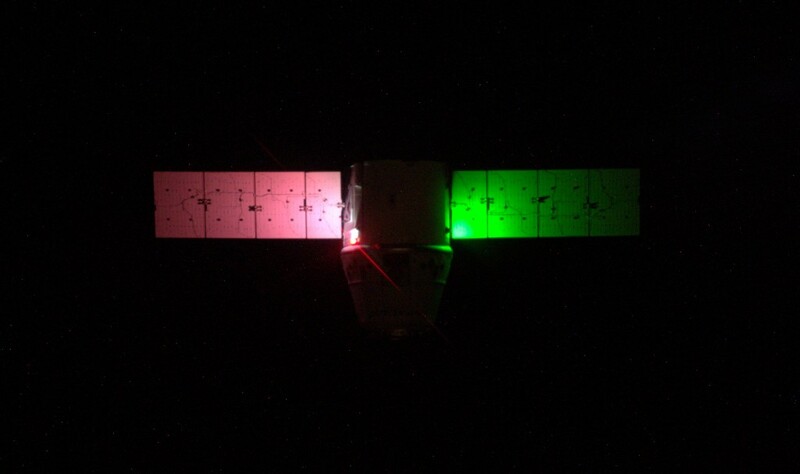 Dragon also starts orbit adjustment maneuvers on Flight Day 1 to increase its orbital altitude and begin phasing to reach ISS on Wednesday for a robotic capture at 11 UTC.